The battle continues, two full years after I found that moths had infested a storage locker, destroyed treasured antique rugs and then somehow hitchhiked into the apartment. Summary: Beaten back, but not extinguished. Fighting requires a two-pronged assault: killing (in any cycle of the moth's development), and deterrence for those who elude efforts. 1. Place moth traps in closets and rooms. The traps kill only breeding males but it's been sobering to see how many hit the trap in places we have never seen a moth. I've been using Aeroxon with food results and just ordered another brand from eBay seller Kritterkill, who claim to have a superior product. In a 1,200 square foot condo, I use 8 traps and change them every three months. 2. Use hanging moth cakes, such as Enoz in closed closets and the storage locker. Freezing works too, if your freezer is at least -8C/18F. (Chest deep-freezers are colder than fridge freezers.) Advice varies about how long to leave them in, between 12 hours and a week! But when worn, if any eggs are incubating in your house—eggs can live dormant for over two years—items are vulnerable to re-infestation. 5. Squish anything we see; this is not the time to go all PETA. Moths like dim places but we've also found them hanging out on a wall in full light. 1. Store woolens in snap-lid boxes and breathable garment bags; we secure the hanger hole by covering with tissue paper and duct tape. For things that hang in closets because we're wearing them often, I shake out and switch up the arrangement. Moths love undistrubed nooks. 2. Place cotton balls saturated with essential lavender oil in dresser drawers and renew monthly. 3. Regularly launder, brush (outdoors), and sun garments; especially those not worn often. 1. Moved built-in furniture such as closet systems to clean behind. Just too hard. 2. Used hardware-store insecticides that contain PDCB or napthalene, or called exterminators: worried about toxicity. 3. Tried methods that are commonly touted but have not yielded scientific evidence of effectiveness (cedar blocks, citrus fragrance). My research turned up an exhaustive list of what incubating clothes moths will eat besides your woolens: dust, hair (including that from pets), lint, down, fur. They munched my cotton damask napkins! They'll eat synthetics if blended with wool. Where do they come from? No one orders clothes moths or carpet beetles from J. Crew! But think about it: the boutique owners I've talked to who specialize in fine woolens admit they, too fight moths year round, and invisible eggs can easily travel. Here's a casemaking clothes moth near its eggs, so you can see how hard they are to spot, and eggs are usually hidden within folds or inside garments. Moths can "ride in" even on things they don't normally like, such as a shopping bag. And they don't just come from flea markets; that cute tufted pillow you bought at the department store may harbour eggs. I'm beginning to think of the moth problem as herpes for households: once you've got it, you can control it and that's all. For an excellent, comprehensive guide to control, read this article by Washington Toxics Coalition. The most radical approach is Moth Acceptance. That's right: Holes? No problem. That's the tack taken by some local hipsters who buy moth-munched vintage cashmere and wear it as is. Could this be the new bra strap? The owner of a vintage store just shrugged when I pointed out holes and said no one cares. But I don't want Swiss cheese cashmere. Our fine-fabric menders are on first-name terms with LeDuc, who has sustained more damage thanks to his more casual cleaning and storage habits. Handy with a needle? You can also find YouTube tutorials for mending holes in knits, but true or even close to 'invisible' level reweaving is an art. The photo above is from The Vintage Traveller, a terrific blog written by the talented sewer and vintage collector Lizzie Bramlett; in this post she discusses reweaving a hole in her heavy Pendleton wool, and notes that restoration of fine knits is for experts. And so it goes, a continual, frustrating skirmish shared by many of my friends and neighbours. (Once you admit you have moths, others open up.) At least they're not bedbugs, and I have lost only one sweater so far. But in the last two days I killed two flyers, so it ain't over. Oh! I had pantry moths ride in last year. I blame dog kibble but I don't know for sure. I cleaned cupboards, bleached, and washed every item time after time. 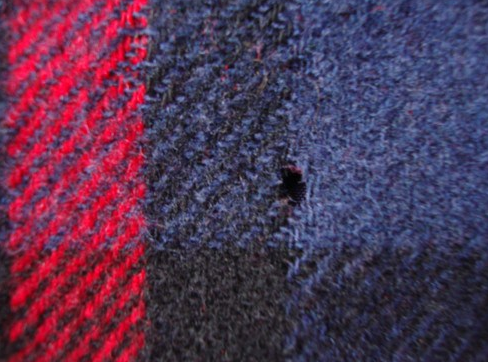 I occasionally find a moth hole in my best woollens but I mend. You're right in that it just might be the "new normal". I'm so sorry that you're having to fight this fight; but as usual, you've turned something unpleasant into a tremendously useful post! I just hope I NEVER need this information. Not about eradicating them but if I have a coat or jacket with just a bit of pile, I take a fine needle and poke out some of the back fibers through to the front and that works a treat to fill the holes. Thanks for sharing the fruits of your research and labours. And thanks to Janice for suggesting that we wash new clothes...I never thought of that and will do so from now on. Good luck with your control measures, if anyone can confound these critters, it's you. Have you tried Eucalan (Canadian company) for washing fine fabrics? It was recommended to us by a reweaving company after a moth-in-cashmere disaster years ago and we swear by it. It is infused with lavender and you wash but don't rinse it out. Works for hand washing or by machine. We never travel without it! Love your blog... thanks for all the hard work and thoughtful posts. my husbands cashmere scarf looked like a mesh bag as it was so full of holes. I had cedar in all our closets and drawers as well as lavender sachets...I am hoping that they do not attack again. Makes me want to try and learn to appreciate synthetics as alternatives to my beloved cashmere! There are quite a lot of bedbugs hereabouts and no, they don't just live in conditions of squalor. They live on blood, not minute scraps of food as cockroaches do. Lavender does not, not not kill moth eggs, larvae or adults. I have read every paper with some credibility I can find on moth-killing agents (not the ads placed by natural-food stores, which tend to repeat the same blather. There is unfortunately a correlation between toxicity and effectiveness. Lavender at best is a deterrent, they might "look elsewhere", but a hungry moth may indeed hit your Eucalan-washed sweater or lavender-sachet-strewn drawer. If you can, store •clean• fine wools in airtight containers, like snap-lid boxes or tight-seal storage bags. But if the garment goes into any airtight storage container with eggs on it, the lavender will not kill the eggs. Cedar is only effective in ¶very• high concentration in an airtight space, and then only while the cedar oil is in high concentration for the volume of space. The blocks people use are useless very soon. The worst place for control is probably closets and armoires, where things hang, and you open the doors often. I believe a lot of "my" moths live behind our many high bookshelves. Le Duc traps a lot in his office, and there's no wool rug, but there are hundreds of books, and many crannies. 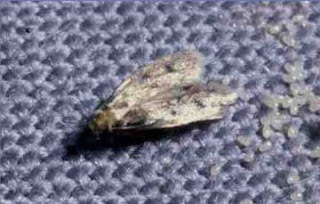 Clothes moths will also eat skin flakes, nail clippings, and dust. Though I have no wool in the bathroom or laundry room, I always trap some in there. Mme: I would take pantry moths over clothes moths any day- not the same critter. Pantry moths are disgusting but they do not destroy your carpets, clothes or sanity. LauraH: Nice of you to send those wishes but after 2 years I am dubous I can do it. I once vanquished them in our house but now, in an apt. it is harder... I have seen them in the halls and once in the elevator. lagatta: If you find the traps locally please let me know; I have looked everywhere. Sometimes Urban Nature Store have free shipping specials. And when your building was being renovated, EVERYTHING was removed inside, there was nothing left but a shell that looked like a wartime ruin looming over the neighborhood. The old church was full of wood, nooks, crannies, and a century of dust and fibres from people's "church" clothes. This is also a downside of our climate that is (despite the 2014-15 hard winter) overall much milder than 40 years ago. Where does one buy snaplock boxes - are those larger, flatter versions of the ones at Canadian Tire for food storage? And the bags; for the moment my new merino pullover is in a ziplock bag (new, obviously), but it is still living in my freezer compartment, which is probably not cold enough to kill moths. Do "les mites" also eat silk? As for pantry moths, evidently glass storage is best; Livia's dry food is all in big Mason jars but I do have some dry foods still (untouched) in their original bags; should everything go into glass immediately? Asking people who have battled these. Fortunately I've never had any. Clothes moths will eat all natural fibres including (besides wool) silk, linen, fur, cotton (ergo, my napkins), feathers, and blends that include these natural fibers. You can also buy •breathable• sweater and garment bags on eBay or from closet-organization sites. Storing fine fabrics in plastic bags creates its own problems as the fibres don't breathe. Some persons wrap their sweaters in acid-free paper before placing them in the plastic bins. I rotate a few at a time, keeping those I'm wearing in a drawer, so nothing is in the snaplock full time. Those oversized cans like the kind caramel corn comes in are also good. Occasionally you see those in stores like Sally Ann; if so, grab and use for mufflers. Oh dear - I feel your pain. About 40 years ago, in a different life, we discovered that carpet beetles came with the home we had purchased a year before. They were in the cabinetry under the kitchen sink. I was a natural fiber addict and had a house full of wool, silk, linen and cotton fabric and yarn. I had never had a moth or carpet beetle before. Everything and every room was infested - including food, hair brushes and cabinetry. Most of my fabric was pull of holes. Anything that was protected was spared. We had an exterminator. I ended up getting rid of about 90% of my fabric and yarn. That ended my compulsive sewing, knitting and rug braiding and frankly it was a relief. I'm now reasonably careful about storing things now and have not had a repeat problem but I shudder when I see one of the fuzzy little bugs climbing a wall. I store my Eric Bompard cashmere sweaters in pillow protectors that are supposed to be dust mite proof for people with allergies. I buy them cheap and in quantity in discount stores. I hang my best wool clothing in canvas garment bags. And cross my fingers. Carolyn: Pillow protectors! Brilliant, thanks for the tip. They are cheaper than sweater bags though I have been thinking of buying some of those, with the window that shows what's inside. (But is it worth the extra cost?) Canvas garment bags are the gold standard-breathable-but be watchful just the same. Le Duc's suit was in one, but the small hole through which a hanger protrudes was clearly enough to give them access; they had a field day in there. A jeweler's loupe is useful for examining wools to see if there are eggs or young larvae. The eggs when laid are less than the thickness of a human hair, so easy to miss. If in doubt take the piece outdoors and give it a good brushing and airing. Some are deemed effective (by credible sources such as university fabric-preservation departments) but none kills- they just encourage them them to find other snacks. Once you have them, unless you can kill the eggs, larvae and adults so they cannot reproduce, you'll still see them. No amount of cinnamon, clove, mint, thyme or other fragrance will do that. We had an infestation last year and lost a huge, heirloom rug from Turkey and had significant damage to two others, lost sweaters and scarves and other items. It took forever to get rid of them or at least I hope we have. We've caught nothing in the traps for a a while. Our rug expert said the best way to get rid of them in smaller rugs is to vacuum the rug. put it in the sun (both sides) for at least two hours and then vacuum again. He also suggested taking everything out of the closets (even synthetics)and airing them -- moths do not like sunlight. This is obviously easier in Florida than Canada. I hated to job of getting rid of all the cases so they would not be invited back -- turned over beds, moved furniture, vacuumed curtains, cleaned all closets. What a mess!